Times are hard in the mountain city of Fellsmarch. Reformed thief Han Alister will do almost anything to eke out a living for himself, his mother, and his sister Mari. Ironically, the only thing of value he has is something he can’t sell. For as long as Han can remember, he’s worn thick silver cuffs engraved with runes. They’re clearly magicked—as he grows, they grow, and he’s never been able to get them off. While out hunting one day, Han and his Clan friend, Dancer catch three young wizards setting fire to the sacred mountain of Hanalea. After a confrontation, Han takes an amulet from Micah Bayar, son of the High Wizard, to ensure the boy won't use it against them. Han soon learns that the amulet has an evil history—it once belonged to the Demon King, the wizard who nearly destroyed the world a millennium ago. With a magical piece that powerful at stake, Han knows that the Bayars will stop at nothing to get it back. Meanwhile, Raisa ana’Marianna, Princess Heir of the Fells, has her own battles to fight. She’s just returned to court after three years of relative freedom with her father’s family at Demonai camp – riding, hunting, and working the famous Clan markets. Although Raisa will become eligible for marriage after her sixteenth name-day, she isn't looking forward to trading in her common sense and new skills for etiquette tutors and stuffy parties. Raisa wants to be more than an ornament in a glittering cage. She aspires to be like Hanalea—the legendary warrior queen who killed the Demon King and saved the world. But it seems like her mother has other plans for her--plans that include a suitor who goes against everything the Queendom stands for. 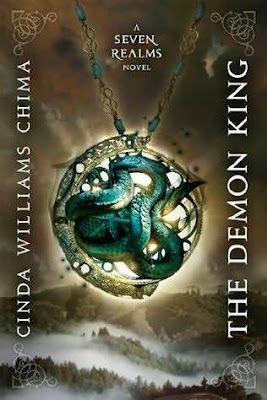 I loved the first two books in Chima's Heir trilogy but I didn't like the third one at all, so I'm hesitant to purchase this book. I keep seeing it in the store however, and each time I drool a little. What book do you need to go grab?